keyboard. Then you can protect the iPad screen. It is much more convenient to input with actual keyboard than the virtual one. If you really would like to rely on the iPad for productivity then it would be a good idea to know how to connect an iPad to a Bluetooth keyboard. 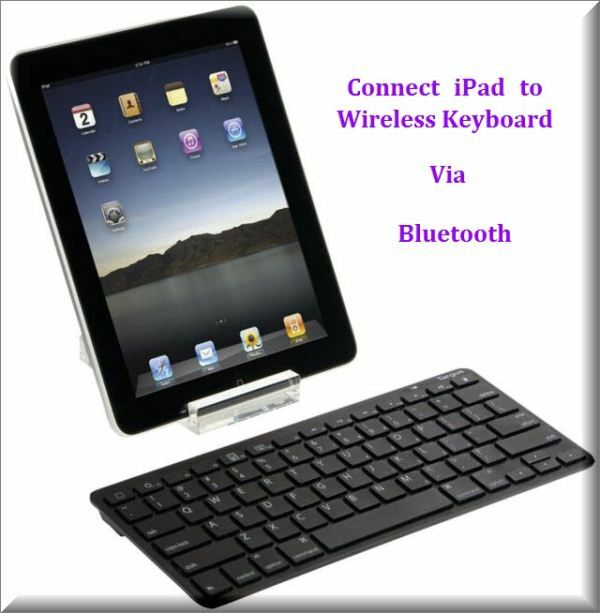 To connect a Bluetooth keyboard to the iPad is similar to connect Bluetooth stereo headphones to the iPad. Then let’s come to the steps of connecting an iPad to a Bluetooth keyboard. Turn on the iPad and tap “Settings” on the iPad home screen. Then select the “General” option. Turn on the iPad Bluetooth. Slide the “Off” button to “ON” on the Bluetooth. Then iPad begins detecting Bluetooth-enabled devices. Make sure the Bluetooth keyboard is in discoverable mode. In that case, your iPad can detect it via Bluetooth. Then select the Bluetooth keyboard on the iPad screen. On the keyboard, enter the passkey the iPad prompts for after the device has connected successfully. You can use the keyboard now. If you wouldn’t like to use the keyboard, just turn off the Bluetooth on it, or turn off Bluetooth on the iPad. What’t more, you are unable to use the iPad virtual keypad while a Bluetooth keyboard is connected.